How to avoid E-Learning Demons this Halloween! E-learning originally shouldn’t be scary. But not being well versed with e-learning can certainly be scary at times. Fortunately, this Hallow’s day, we will learn ways to skip the bumps and avoid the common mistakes in e-learning. Trick: But you can’t afford to waste time searching for the right path of learning trying to complete an e-learning course. Treat: Having a simple designed user interface can actually light the way with learner centric navigation, track records and signposts in order to lubricate the learning process.In order to guide the learners to show where they’ve been and where they’re going. Spooky sound effects: When you hear a horror movie soundtrack or, watch a crocodile hunting video, you know that it’s playing on your deepest biologically-engrained emotions. The scary music in ‘jaws’ makes you feel like you’re the mama marmot and those children getting attacked on the beach are your own babies. 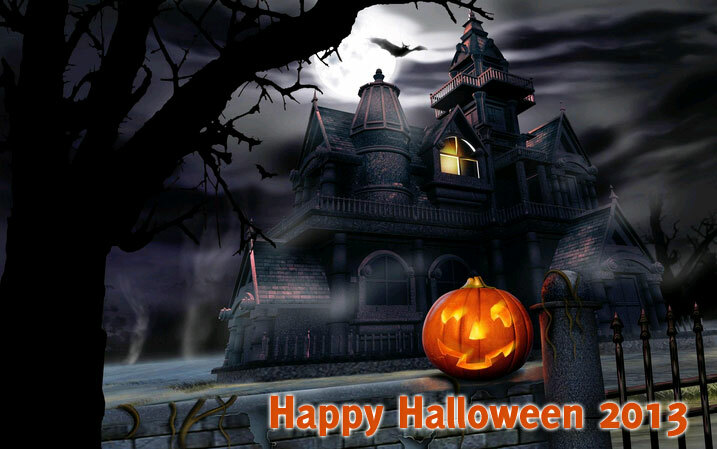 Having such sound effects like thunder, lightning etc can set a perfect scary ambience for your Halloween visitors. Trick: Having annoying, distracting and loud sound effects can ruin an e-learning module completely. An e-learning course with super low voice over, loud music or unnecessary interactivity sound hampers the learning and distracts the learner. Treat: To have sound design such that it connects with the deepest biologically engrained emotions to increase interactivity and engagement supports the learners’ reason to study rather than feeling distracted, panicked or wanting to scream! No one at home: Everyone experiences this, once every Halloween. Some neighbors decorate the house with amazingly scary lighting, witches and scare crows—and go on vacations! This costs guests their precious candy collecting time, wandering and observing decorations without any fruitful gain. Trick: Luring the learners in an e-learning course which does not deliver the expected information is wicked. Online course made of superficial eye candy looks pretty but has no substance, so it fails to educate well. E-learning programs without any behavioral changes amount to nothing but empty calories and waste of time. Treat: Create images and visuals that are interactive and act as communication devices that engage, teach and motivate the learners (visitors). Using clear, visually effective and interactive images and equally effective content will be able to produce better results with increased retention capacity. The Sweet Tooth: Halloween for kids is candy. Collecting and eating effectively followed by headaches, upset stomachs and lethargy are the effects of the over night developed sweet tooth! Trick: Often too much of anything has side effects and the same thing happens in e-learning courses with too much stuffed information. This leads to frustration, distraction and disengagement. Don’t victimize learners with concentrated information! Treat: Instead, give learners diluted information in chunks that are properly organized and easy to digest. A sorted e-learning program with clear instructional strategies and fair comparison between need to know and nice to know information proves to be useful to the learners in order to avoid the indigestion. This 31st October, treat your learners to a training that offers a user-friendly interface, meaningful visual content, productive and less distracting sound design, and easy instructional strategies. Your training and their learning will be successful without making any bones about it! Disengaged employees cost an estimated $450 billion to $550 billion average loss of productivity annually. Imagine a rowing team with two out of eight members rowing their hearts out, three distracted by the scenery, one rowing backwards & two actually trying to drown the boat. Can you predict the result? Comparing this scenario with today’s business reflects that employee engagement plays an important role in the growth of any organization. Lack of Engagement! It is simply the difference between the efforts your employees invest and their actual capabilities. A large number of actively disengaged employees is one of the biggest reasons of low productivity across all the business verticals. These disengaged employees not only have lower contribution to overall organization performance but they also adversely affect performance of other employees. An engaged employee is self motivated, she feels a sense of belonging & believes that she has made a great choice by opting to work with the organization. Interactive training sessions can help in creating & fostering these beliefs within the workforce. Although it is obvious that improving Employee Engagement will result in better performance & organizational efficiency, there are a number of factors that might affect an organization’s ability to achieve it in reality. Traditional training methods are costly, time consuming & generally result in low employee participation due to fear of failure or of saying wrong things in front of large groups. E-learning enables organizations to deploy cost effective interactive employee training solution in a timely manner. Self paced, online learning makes it easier for employees to learn at their own speed in privacy & convenience of their own cubicles, homes or even cars. Now imagine the same team with all the members rowing forwards fully utilizing their newly acquired rowing skills. Can you predict the result? Are you or your organization “actively engaged” in improving employee engagement? Is e-learning in your plan to build an actively engaged workforce? If yes, give us a shout at info@timelesslearntech.com & we will provide you with best in class e-learning solution to improve employee engagement & productivity. Should your organization club “Talent Acquisition” and “Learning & Development” departments? How employee training can boost leadership quality of employee?